In the fine tradition of Monty Python: ENGLAND 932 A.D. King Arth…ahem…King Edward and the Knights of Around CAID must choose a new Champion for the Barony of Dreiburgen. 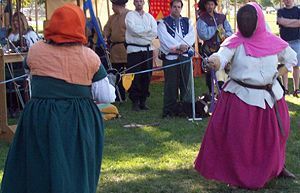 Join the Barony for a day of fighting, merriment, fighting, flying livestock, fighting, swallow races, fighting, and, did we mention fighting? There will be armoured combat and rapier. There will be youth activities. There will be Arts and Sciences activities. There will absolutely, positively not be any silliness. Got that? And, did we mention armoured combat and rapier? And, now for something completely different….Champions will be chosen by a very non-traditional form of tourney, which we will explain when we get there because, frankly, we haven’t even figured it ourselves yet. Plan on LOTS of fighting, we absolutely guaranty nobody will be out in two. No, really, we mean it. Trust us. Directions: Take your favorite combination of freeways to the 91. Get off 91 at Van Buren. Head north on Van Buren (left if coming from west/south, right if coming from east/north). Turn right on Garfield, which is the 3rd street after you cross Magnolia. The park is at the northwest corner of Jackson and Garfield. Merchants: Sorry, no merchants at this site. This page was last modified on 30 October 2011, at 19:42.